The Hobbit: The Desolation of Smaug set photo of Peter Jackson in action. Also pictured is Martin Freeman, who plays Bilbo. Peter Jackson on the set o The Hobbit: The Desolation of Smaug. 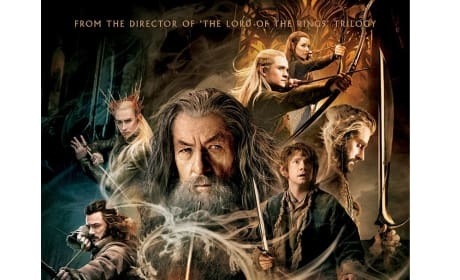 The latest The Hobbit movie lands December 13. 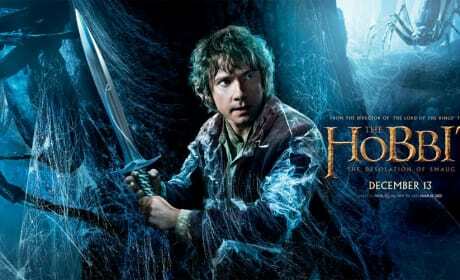 The Bilbo "sword" poster has landed for The Hobbit: The Desolation of Smaug. 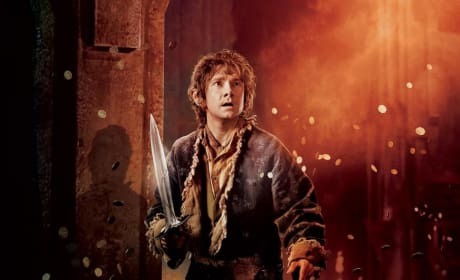 Bilbo is played by Martin Freeman. The Hobbit: The Desolation of Smaug Bilbo poster. 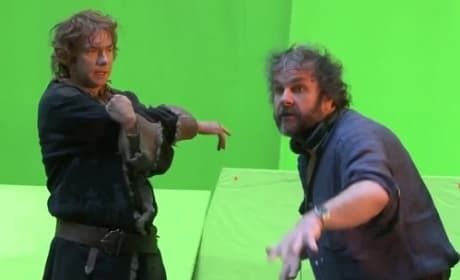 Martin Freeman is Bilbo. 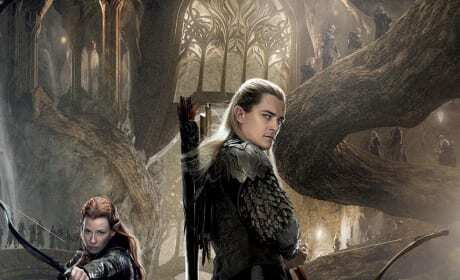 The Hobbit: The Desolation of Smaug Elves poster. Orlando Bloom is Legolas and Evangeline Lilly is Tauriel. 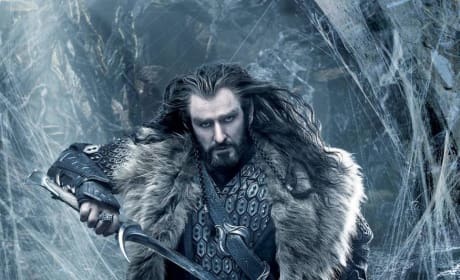 The Hobbit: The Desolation of Smaug poster for Richard Armitage’s Thorin Oakenshield. Peter Jackson is back in Middle Earth for the fifth time. 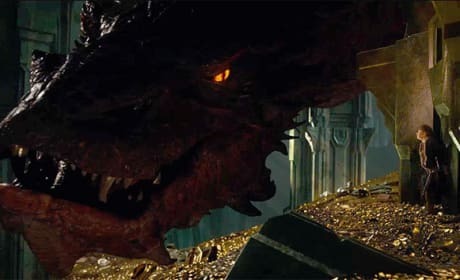 Smaug gets his close-up in The Hobbit: The Desolation of Smaug. Also pictured is Martin Freeman's Bilbo Baggins. 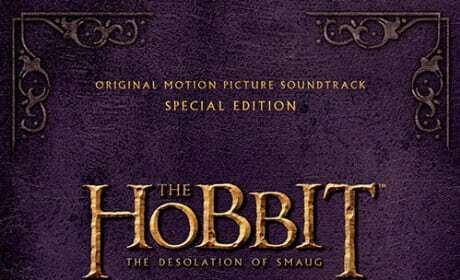 The Hobbit: The Desolation of Smaug soundtrack. The second in Peter Jackson's The Hobbit trilogy lands December 13. The prize poster from The Hobbit: The Desolation of Smaug. The second chapter in Peter Jackson's The Hobbit trilogy lands December 13. 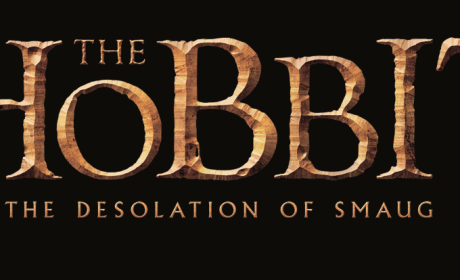 The title treatment for The Hobbit: The Desolation of Smaug. The second chapter of Peter Jackson's The Hobbit trilogy lands December 13. 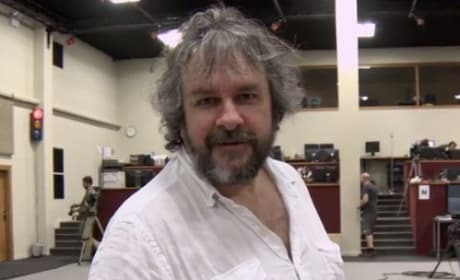 Peter Jackson appears in his latest video diary from The Hobbit set. Jackson is sharing footage from working on The Desolation of Smaug and There and Back Again. The dragon Smaug from The Desolation of Smaug. 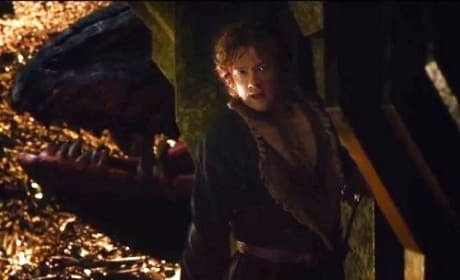 The second The Hobbit movie introduces us to the evil dragon.